While studying our services and products you may wish to ask many questions. Here you can find the answers to the frequently asked questions from our customers. This page aims to provide answers to your questions concerning trading conditions of IFC Markets. IFC Markets is a leading financial company providing services in Forex and CFD markets. This section provides information about trading platform, it contains answers to questions, like what is the difference between NetTradeX and MetaTrader? Here you can find the answers to all your questions concerning money transfer in our system. IFC Markets is a leading financial company providing services in Forex and CFD markets. In this page we introduce a list of questions where you can find the answers to your questions about forex trading, including what type of broker is IFC Markets, is it regulated, etc. If the answers provided here do not meet your requirements, please, do not hesitate to contact us. Do I need to pay any fees and surcharges? Commission is charged for opening and closing positions on Stock CFDs. It varies depending on the Stock Exchange - the lowest fee is 0.1% of the position volume. For the U.S. stocks the commission is equal to $0.02 per 1 stock. What is the minimum deposit amount required by IFC Markets? Minimum allowed deposit amount depends on the trading account type. There are no minimum deposit amount for NetTradeX Beginner and MetaTrader 4 Micro accounts. For Standard account in NetTradeX it is $1000. For Standard account in MetaTrader 4 - $1000 for US dollar accounts, €1000 for Euro accounts and ¥100 000 for Japanese yen accounts. What types of real (live) accounts does IFC Markets offer? MetaTrader 4 - accounts Micro and Standard. For more information see the Trading accounts section. What are the initial deposit and current equity restrictions? What trading volumes are offered? IFC Markets offers different allowed trading volumes for different financial instruments and account types. Allowed trading volumes may also be limited by the free margin of your account. In NetTradeX trading-analytical platform volumes are set in units of the base currency or asset, while in MetaTrader 4 it is set in lots. In particular, for Beginner accounts the minimum volume for currency pairs is 100 units of base currency with a tick of 0.01 units. For example, you may have a deal in EURUSD with volume of 124.64EUR. For more information about minimum and maximum trading volumes see the Trading Volumes for NetTradeX and MetaTrader 4 trading platforms. What leverage size does IFC Markets offer? For MetaTrader 4 accounts the leverage for trading Stock CFDs is always 1:40 (margin 2.5%). For NetTradeX accounts the leverage for trading Stock CFDs equals 1:40 if the account leverage is 1:40 or higher, or equals the account leverage if it is less than 1:40. For MetaTrader 4 accounts the leverage for trading Commodity CFDs is always 1:40 (margin 2.5%). For Continuous Commodity CFDs the leverage equals the account leverage. I have an account denominated in USD. Can I change it? IFC Markets offers its clients accounts in American Dollar, Euro and Japanese Yen. You cannot change the denomination of your account, but you can open another account denominated in a different currency. Then you can simply transfer funds from your old account to your new one. Can I change my leverage after opening an account? Yes, you can change your leverage by logging in to your Profile, where the function of modifying leverage is available. Do you offer a Partnership program? Yes. IFC Markets offers a Partnership program. The partnership program has a two-level structure. It means that you will receive additional commissions for trading turnovers of the clients, attracted by your SubIBs. For more information, please, go to our partnership section. Can I have an account in any currency? You can open accounts in US Dollar, Euro and Japanese Yen in MetaTrader 4 and NetTradeX platforms. Are there any payments to open an account? No, there are no any fees to open an account. Opening an account is quick, easy and free. You just need to register in our Profile and open an account in one of our platforms from there. For more information, please, visit our page of Account types. You can have as many accounts as you wish. What documents do I need to authorize my profile? You need to send the copy of your ID via email. It can be your Passport, Driving License or any other Identity document. It should be an attached image file with legible and clear details. Why do I need to authorize my profile? After authorizing your profile you will be able to perform bank card deposits and bank wire withdrawals. Profile authorization also provides you with additional security of your personal data and access to your trading accounts management. After authorizing your profile you will be able to restore your password by sending us a copy of your Identity Document. Can I face a problem if my documents are not in English? In general we accept the documents in any language. But we reserve the right to request documents in English or a notarized translation of them. What address should I specify in my profile information? You need to specify your address which can be associated with any of your personal payments via documents - so – called billing address (we usually do not require documents on such payments). What leverage do you recommend? For all inexperienced traders we recommend to start with 1:100 leverage. Such leverage fits best according to money management rules. For experienced traders the leverage depends on trading purposes and it is recommended to be discussed with your account manager. IFC Markets provides fixed spreads for all groups of instruments, except for Stock CFDs. The lowest spread is 1.8. For Stock CFDs the spread corresponds to the real stock exchange trades. What is short margin (stop-out) level? You will have a Short Margin situation, if ratio of the balance taking into account profit/loss of the open positions to the margin value, reaches 10%. When facing a Short Margin, that is when margin level equals to 10%, positions will be closed, starting from the most unprofitable ones. Do you offer trading signals? No, we do not provide trading signals. But clients with MT4 accounts may use trading signals within the overall service of Metaquotes. Does IFC Markets offer a free demo account? Yes, IFC Markets offers a free demo account both for NetTradeX platform and MetaTrader 4. Demo accounts do not expire. What instruments can I trade with IFC Markets? We offer our clients trading with Currency pairs, Precious metals, Commodity CFDs, Index CFDs, Stock CFDs, unique gold instruments and personal composite instruments (PCIs). For details go to trading instruments specification page. I am a USA resident. Can I trade with IFC Markets? No. Unfortunately we are unable to open accounts for US residents at this time. I’m new to Forex. Do you offer educational resources? Yes, we provide educational materials for the beginners. Educational part of our website covers all the basics of trading in Forex and CFD markets, technical analysis and much more. Also we have several educational books that will be useful for the newcomers. For more information, please, go to trading books section. Do you provide technical analysis? Yes, IFC Markets provides technical analysis. You can find it in technical analysis section. You may conduct technical analysis on your own (with popular technical indicators and graphical objects) in trading terminals offered by our company fpr PCs and mobile devices with Windows, Android, iOC, MacOS, Windows Phone, Windows Mobile systems. Does IFC Markets offer an Economic calendar? Yes, we offer a free Economic calendar to keep you up to date with upcoming economic data releases and events around the world. You can see it in Economic calendar section. On the part of IFC Markets there is no fixed minimum replenishment amount. Minimum size of account replenishment depends on the selected method (billing system). Are there fees for using your platforms? There are no fees for using our platforms. How can I log in to NetTradeX trading platform after opening an account from the Profile? If you want to access your trading account for the first time (or from another PC), go to "File" in the main menu and choose "Create existent login" option from the context menu. Enter your login name (rХХХХХ - for real account, or demoХХХХХХ - for demo account) and click "Next". Select a type of account (Real or Demo) and click "Next". Tick the "Save password" box (if you want to save your password), enter your password and click "Next". After creating the login, you will see it in “Navigator” window, under the section "Logins". To log in you will just need to double click on it and press “OK” or right click on it, press “Connect” and “OK”. NOTE: Existent login is added only once on every PC you access your trading account from. How can I add additional instruments to the “Market Watch” window in NetTradeX? If you cannot find an instrument in the "Market Watch" window, please, go to "Trade" in the main menu and select "Instrument Browser" option of the context menu. In the opened window choose the group of instruments you are interested in, unfold it and select the instruments you want to add. Once selected the trading instruments, click on "Add to used instruments" button. How can I open a new chart window in NetTradeX? Select "Trade" in the main menu and choose “New chart” option from the context menu. In the opened window select the instrument, the chart of which you want to be displayed. Right-clik on one of the trading instruments in the "Market Watch" window, select "Chart" option from the context menu and choose a timeframe in the pop-up menu. Where can I find the minimum order distance for an instrument in NetTradeX? Before setting an order, open "Trade" in the main menu and select "Instruments in Use" option from the context menu. In the opened window open up the groups of instruments and click on the instrument you are interested in. In the "Instrument Info" section on the right side you will see the "Min. Order Distance" information in pips. Let us note that the distance will be set in pips of the terminal, i.e., for example, for the most currency pairs the pip will be equal to 0.00001 (5th sign after the coma), and for the yen pairs – 0.001 (3rd sign after the coma). How can I reduce the volume of my open position in NetTradeX? You have opened Buy position on EURUSD pair with 10.000 volume. It can be reduced by an unlocked Sell position on EURUSD of a smaller volume. Your initial 10.000 volume has been reduced to 8.000. What can I do if my NetTradeX platform does not connect to the server? Check your internet connection. If you are not able to solve the problem with your connection, ask your LAN administrator or your Internet provider's support service representative. To connect to the server you need to establish a TCP connection at one of our server's addresses. To find out our server's addresses, please, go to Settings, followed by Terminal, and open Network tab. Upper list contains the Real server's addresses, and lower list contains the Demo server's addresses. If all the servers are marked as active, you can deactivate some of them, removing ticks from the tick boxes and try to reconnect. If after these steps you could not establish a connection, contact your ISP support representative. What mobile operating systems do your platforms support? Our trading platforms support the following mobile operating systems: iOS, Android. Additionally, the NetTradeX platform supports Windows Phone and Windows Mobile operating systems. Where can I find my account balance and trading history in MetaTrader 4? You can see your account balance in the "Trade" tab of the "Terminal" window. Trading history can be seen by clicking on the “Account History” tab in the same window. You can also customize the history timeframes and get reports by right clicking on any line in your "Account History" tab. What is the difference and which platform to choose: NetTradeX or MetaTrader 4? NetTradeX and MetaTrader 4 have both the identical and different features. You can compare both platforms and choose the one that fits your trading requirements. Can I use Expert Advisors or Robots with IFC Markets? Yes, you can. We provide Program trading both for NetTradeX and MetaTrader 4. NetTradeX trading platform has a complimentary trading terminal which allows users to automate trading through the built in language NTL+. You can download the terminal from our website. In MetaTrader 4 there is a possibility to automate the trade and technical analysis with the help of integrated program language MQL4. You can learn more information about automated trading from our program-trading section. MQL4 and NTL+ are compatible, that is why advisors, scripts and indicators, created through MQL4 language in MetaTrader 4, can easily be run in NetTradeX after a little transformation on the basis of the offered standard compatibility library. Trailing Stop regime provides a mechanism for automatic update of the linked order Stop Loss by the following rule: if the profit of the position becomes higher than the set fixed distance, Stop Loss order moves to the level at which the difference between the current market price and the order price is equal to this distance. If the Stop Loss order was not initially set, while Trailing Stop regime was set, when the profit of the position becomes equal to the set distance, Stop Loss order automatically is set at the opening price of the position. In NetTradeX platform Trailing Stop regime works in server mode, i.e. the regime is performed on the server even if the terminal of the client is turned off. I forgot the password of my NetTradeX account. What should I do? If you forgot the password of your demo account, you can request us to reset it by Live chat, E-mail or Skype. Otherwise, you can just open a new demo account. If you have forgotten your Real account password, use the password reset form. How to enable news feed on the NetTradeX terminal for PC? Are there any limitations on available trading instruments depending on the trading platform? Currency pairs, precious metals, continuous Index and Commodity CFDs, CFDs on US, German, English, Russian, Australian, Japanese and Chinese stocks, Gold instruments are equally available on both platforms. An opportunity to create personal composite instruments (PCIs) and to use such instruments from PCI library is realized also on NetTradeX platform. How can I place a pending order in NetTradeX? Select "Trade" from the main menu and click on "Set order". Right-click on the line of the financial instrument in the "Market watch" window and choose "Set order" option from the context menu. 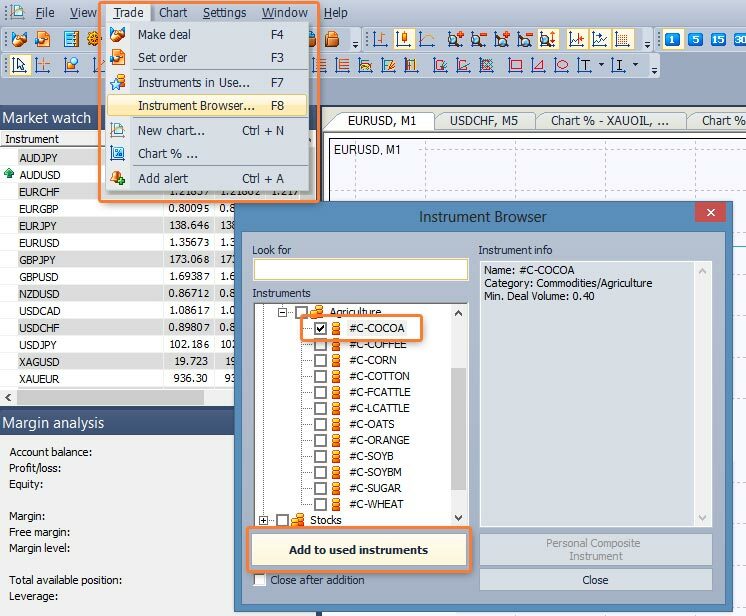 Right-click on "Chart" window of the financial instrument and select "Set order" from the context menu. In "Open positions", "Sum open positions" and "Orders" windows right-click on the position (order) line of your preferable financial instrument and select "Set order" from the opened context menu. How can I modify or delete a pending order in NetTradeX? To delete the order in "Orders" window right-click on the line with the order and select "Delete" option from the context menu. To modify the preset order in "Orders" window right-click on the line with the order and select "Edit" option from the opened context menu. "Orders" dialog window will be opened, where you can change any parameters of the order. How can I place a market order using NetTradeX? Choosing “Trade” from the main menu and clicking “Make deal”. How can I place a pending order on MetaTrader 4? Select "Tools" from the main menu and click on "New order". Click on “New order” button on the toolbar. Right-click on one of the instruments in “Market watch” window and choose "New order" function from the context menu. Right-click on "Chart" window of the financial instrument, choose “Trading” from the context menu and click on “New order”. Right-click on “Trade” window and select "New order" from the opened context menu. How can I modify or delete a pending order in MetaTrader 4? To delete or modify a pending order right-click on the line with the order in “Trade” window and select “Modify or Delete order” from the context menu. How can I add additional instruments to the “Market Watch” window in MetaTrader4? If you cannot find an instrument in the "Market Watch" window, please, right-click on one of the instruments in the window and select "Symbols" function. In the opened window "Symbols" choose the required instrument in the hierarchical list of instruments, left-clicking that instrument and press "Show" button. How can I open a new chart window in MetaTrader 4? Click on “New Chart” button on the toolbar. Right-click on one of the instruments in the Market Watch window and select “Chart Window”. How can I reduce the volume of my open position in MetaTrader 4? You can reduce the volume of your open position by closing a part of it. Right-click on your open position in “Trade” window, choose “Close Order” from the context menu. In the opened window set volume size you want to close and click “Close” button. What server name should I use in the mobile terminals MetaTrader 4 for iOS and Android? How can I make a deposit into my trading account? Besides these worldwide payment systems the company offers specific payment systems for different regions, taking into consideration each region's requirements. How can I withdraw funds from my trading account? You can withdraw funds by the same method you have made a deposit. If you deposit via the bank card, the withdrawals will be performed via the bank wire. How much am I charged for depositing/withdrawing funds? You pay the commission of the payment system only. We do not charge any additional commissions; moreover, for some payment systems we compensate the commission of the payment system. What is the fastest way to deposit/withdraw funds? The fastest ways to deposit/withdraw funds are through online payment systems, as it will take only a few minutes. Where can I find the web money protection code? You can find the protection code of already performed request for withdrawal to your WebMoney purse in the Profile. Log in to your Profile, in the upper menu select Accounts, and open History tab. In the Withdrawals section you will see Comments column, which contains the protection code. How long does it take you to process international wire transfers? The bank trasfer processing time depends on the processing rules of the sender's bank, as well as on the total number of banks involved in the transfer. In most cases, processing should take from 2 to 3 business days. Sometimes, when a wire transfer is performed by a smaller bank which uses a number of other correspondent banks to realize wire transfers, it may take longer the wire transfer to be completed. The processing of card transactions may take several minutes or more. The processing of electronic payment systems (WebMoney and others) may take several minutes and more. Can I withdraw funds to my credit or debit card? You cannot withdraw funds to your credit or debit card. You can only make a deposit through them and make a withdrawal to your bank account. What documents do I need to send when making a deposit with my credit or debit card? After making a deposit from your credit or debit card, you will need to provide us with the scan of your signed card (front and back) for crediting your account. For security purposes, IFC Markets Corp recommends covering all digits except the last 4 on the front of the card. The last 3 digits on the back of the card must be covered as well (IFCMARKETS. CORP. does not require the CVV/CVC code). If your profile is not authorized, you will need to authorize it. For this purpose you will need to provide the scan of your passport or any other Identity Document. What if my bank card's denominated currency differs from my trading account balance currency? You won’t face any problem. The conversion will be performed according to the bank exchange rates. Can I deposit and withdraw funds 24/7? You can make deposit and withdrawal requests 24/7, but it will be performed during the working hours of the Back Office (from Monday to Friday 06:00 to 18:00 (CET). How long does withdrawal process take? Usually withdrawal requests are processed during several minutes during the working hours of the Back Office (from Monday to Friday 06:00 to 18:00 (CET)). But we reserve up to 2 business days to process a withdrawal request in case of some difficulties. Can I have multiple trading accounts and transfer funds between them? Yes, you can have multiple trading accounts and transfer funds between them through internal transfer. How often can I withdraw funds from my trading account? You can withdraw funds from your trading account as often as you wish. I made a request for withdrawal but still haven't got any money. What should I do? In case of such a problem, you need to contact our Customer Support department. IFC Markets does not have any restrictions regarding the withdrawal amount. You may only face limitations depending on the payment system you have chosen. Does IFC Markets accept third party deposits? No, IFC Markets does not accept third party deposits. Why has my Credit/Debit Card deposit been declined? There are a number of reasons why your credit/debit card may have been declined. You may have gone over your daily transaction limit or exceeded the card’s available credit/debit. Alternatively, you may have entered an incorrect digit for the card number, expiry date or CVV code, please verify that these are correct. Also make sure that your card is valid and has not expired. Finally, check with your issuing bank to make sure that your card has been authorized for online transactions and that there are no limitations that are preventing us from charging it. What type of broker is IFC Markets? IFC Markets is an STP broker (Straight-through processing - automatic realization of transactions with financial instruments). This means that we receive quotations from our liquidity providers, and accumulated clients’ orders are transferred to the marketplaces, accordingly. You can see the details of our scheme on the page Model of Order Execution. What are your Back office working hours? Back office works from Monday to Friday 07:00 to 19:00 (CET). How can I reset lost or forgotten password for my trading account? For resetting the trading account password you can use the password reset form. 1. Download and install the trading terminal on your PC or Mobile device. During the registration you will need to fill out the fields with your personal information. After filling out and sending the form you will be asked to confirm your email. If you are going to make a deposit through Bank card or withdraw funds to your bank account, you need to authorize your profile, send the scan of your Identity Document. This can be done by opening “Profile” tab in your Profile. For opening a trading account from your Profile you need to go to “Accounts” tab and choose “Open a new account” function. Next, fill out the form of opening an account, where you will mention the kind of the account (real/demo), the platform (NetTradeX/MetaTrader 4), account type, leverage and account balance currency. The trading account will be opened immediately and its parameters are displayed on the page within a few seconds. In addition, the access parameters will be sent to your email address. In the main menu of NetTradeX terminal choose “File”- “Create existent login”, enter your login, choose real or demo, enter your password and name of the workspace (if it is required). In the main menu choose “File”- “Connect” and the new account will be loaded into the platform and connected to the server. In the main menu of MetaTrader 4 terminal choose “File” –“Login to trade account”, enter your login, password and choose real or demo server. Click on “Login” button, and the new account will be loaded into the platform and connected to the server. For depositing into the trading account in the Profile you need to enter to the “Accounts” tab, choose “My accounts” option and click on “Deposit” button in the section of the necessary account. Choose the deposit method from the drop-down list and follow the steps in the corresponding dialog. As soon as your trading account is funded, you may start trading. You may use "Profit/loss calculator" in the IFC Markets webpage. What is a Margin Level? Margin level is the relation of the sum of the balance and profit/loss of the open positions towards the margin value. The sum of the balance and profit/loss of the open positions is called Equity. You can hold your positions as long as you want for all the instruments. The only exception is for Islamic accounts, where the positions can be hold no longer than 14 days. Do you have a dealing desk? No, we do not have a dealing desk. All orders are automatically transferred to liquidity providers by DMA/STP model. Does IFC Markets allow scalping? Pip is the minimum quotation change. Pip is 0.0001 or 0.00001 for majority of the trading instruments with four or five digits after the point (for pairs with JPY - with two or three digits after the point) while in trading terminals of many companies major currency pairs are quoted with five digits after the points (for pairs with JPY - with three digits after the point). Quotations, spreads and distances of placing orders are calculated in pips. How do I change my personal info (email, mobile number, etc.)? For changing your personal details you need to send an email to the client support department at [email protected]. Mention the details you want to change and your secret word. If you do not remember the secret word, attach the copy of your Identification Document. The gap is a break between the prices which takes place because of a sharp increase or decrease of rates. What will happen if I leave my positions open overnight? For the most instruments when you keep a position open through the end of the trading day, your account will either be credited or charged Swap for that position, depending on the interest rates for borrowing the base and quote assets (currency) on the interbank market. For Swap calculation on currency pairs our company uses LIBID/LIBOR interbank rates and the market rates for borrowing money. We provide preferential swaps for non-currency instruments and zero swaps for Islamic accounts. For more information about the swaps for currency pairs, please, visit Swap rates page. Current swap rates for any financial instrument may be found on Instrument specifications page. IFCMARKETS. CORP. is licensed by the British Virgin Islands Financial Services Commission (BVI FSC). IFCMARKETS. CORP. is part of IFCM Group which also includes IFCM CYPRUS LIMITED investment company (under registration number HE 276909), regulated by MiFID and licenced by CySEC under registration number 147/11. What should I do if the Equity on my trading account has become negative? If the Equity on client’s trading account has become negative as a result of trading operations, that is the client owes to the Company, the client is obliged to pay the debt. In addition, the client has a right to send a request to the Customer support for an operation on the account correcting the Equity to zero. The request will be taken into consideration in a timely manner. Why my Take Profit did not work out, though the price on the chart reached the order level on the chart? For example, you have opened a Sell position and set a Take Profit order. Please note, that as we sell a trading instrument, we open a Sell position at a Bid price (charts in the trading terminals are built according to the Bid price). The closure of short positions means the opening of a Buy position, i.e. each Sell position may be closed only with an opposite Buy position. The opening of a Buy position is performed at an Ask price (a Spread higher than the Bid price). A Take Profit order in your case means Buy, i.e. it is performed at an Ask price. In your case, the Bid price on the chart had reached the level of the Take Profit order, and the Ask price was still above that level. Why did my Stop Loss order work out, while the price did not reach the order level on the chart? For example, you have opened a Sell position and set a Stop Loss order. Please note that as we sell a trading instrument, we open a Sell position at a Bid price (charts in the trading terminals are built according to the Bid price). The closure of short positions means the opening of a Buy position, i.e. each Sell position may be closed only with an opposite Buy position. The opening of a Buy position is performed at an Ask price (a Spread higher than the Bid price). A Stop Loss order for a Sell position means Buy, i.e. it is performed at an Ask price. In your case the Bid price on the chart did not reach the level of the Stop Loss order, and the Ask price had already reached that level, and the order was performed. Profile is a section that defines the client and is available only to him. It includes personal data, existing accounts and other important information. Here clients can open new real and demo accounts, make deposit and withdrawal requests and make modifications. You can register a Profile in our website. Are my funds insured in your company? IFC Markets holds Professional liability insurance in AIG Europe Limited - by this link you can see the certificate of insurance. Our company is present in the market since 2006 and guarantees the security of your funds. Your funds are kept segregated from the company's funds on a separate bank account and cannot be used by the company for any other purpose except for providing margin for your trading in financial markets. In case of high volatility after the release of important news or poor internet connection requote is possible (cancellation of the order execution and an offer of a new price), as the price has significantly changed while the request was passing from the client's terminal to the company's server. To avoid a requote when creating an order you need to set maximum allowed deviation - the allowed deviation from the requested order price. When setting a deviation the order will be executed at the current price, if the difference between the requested and current prices is less than the set deviation. In NetTradeX platform the deviation is set in pips in the Make deal window. 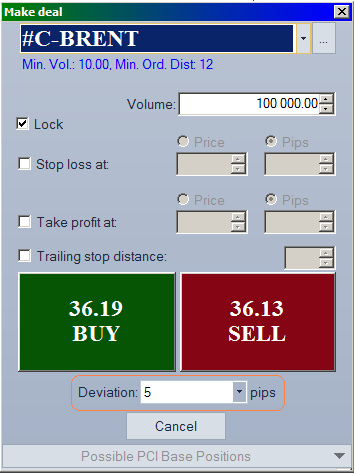 In MetaTrader 4 platform the deviation is set in the same window as well.